So tonight I grabbed another 5 x 5″ Gessobord by Ampersand, dampened the surface and went for it with some paints, same as the afternoon before. Nothing doing. I lost track of the number of times I rinsed off. Maybe four? It didn’t rinse fully, and I had been using bright colors and needed something strong to cover, so after the last rinse, I decided to dry off the surface and do a background. Jill of Jill’s Art Journal posted a beautiful painting yesterday, which she started with some deep, vibrant greens. I didn’t have the same colors, so I decided to go with M. Graham acrylics in Turquoise and Viridian hue and added Golden Iridescent Stainless Steel fine on a whim. Oh, and Golden Titanium White. Jill Kuhn and Chris Cozen make it look so easy! I am still very new to acrylic paints, but this one already declared what it wanted to be. I think. I decided to let this layer dry overnight, and then have another go with the same painting tomorrow. Tune in tomorrow when you’ll hear Miss Piggy say……. (oh, I know I’m dating myself with that one!) Peace, everyone. < May Madness Day 3: Exuberance! wow. I’m kind of speechless. I love it so much. as is. I’d hang it. its beautful Laura. it needs nothing. Debi, now I’ve thought this over a bit – and got over the shock(!) of the nice feedback about this painting. I would like to ask you why. Why is it beautiful, and why does it need nothing? I am trying to understand and learn something and you are a wonderful teacher! And so gracious with your time, so I feel funny even asking you to take more time. Please show me why this is good? Thank you from the bottom of my heart! Did I hear “predictable”? lol let that one go….remember sometimes a painting has a mind of its own, you are suppose to be an obliging accomplice! You know I was very much an insecure child clear through to….now! lol yep, I admit it. Been praying that I learn to trust and know myself and over the years I have been finally seeing a break-through. Hearing it through others never is satisfying, it has to come from within and from God. 🙂 oh man, that is a whole another subject. Ok I did not edit my initial response and it made no sense when I read it back so I deleted and replied again. Sorry for any confusion, Margaret! Looks like a lovely duet between sea and sky…and the energy with the brush strokes really lends itself to the song of ocean waves…at least from here it looks that way. Love what you are doing! Thank you for sharing. Peace. Wow, thanks, Haunani! I definitely was thinking it wanted to become an ocean or beach type of scene. Thanks again for your lovely feedback! Of course I’m serious! Always let things sit for at least a day, sometimes you’re just too close to it to see it. And I agree too, its the ocean with splashes of dolphins, love it just the way it is. Thanks for stopping by, Cathe! I’m out of words, really don’t know what to say. Blown away by the feedback. Last night was the most frustrating night of painting I’ve had probably since last July when I was painting in watercolor every night. Thank you! I also got the “ocean” vibe, and I can see Cathe’s “dolphins” splashing around, too. It’s got a cool, refreshing sense about it just as it is. Judith, please do! Oh and my memory is so bad, I hope I remember your name. I’m glad to know it (at least for this moment lol)! Have a creative day. I’m working on a very ambitious project – a watercolor portrait of one daughter. If all goes well, I’ll be sharing it soon. You can catch a glimpse of it there on the kitchen table. That is ambitious! Looking forward to it! She and her husband moved from Missouri to California last year — he’s from San Diego and finally had enough of our winters. I’ve got plans to do several watercolors around a “California Dreaming” theme. We’ll see how it goes! Oh Laura! LOVE LOVE LOVE! A tumultuous sea with waves crashing and fish or dolphins swimming in a pool is what I see. I cannot even believe you are not totally tickled with this beauty! BRAVO Artista! Bravo!!!!! SO smooth and easy yet confident feeling! Rock start Artist! Seriously – not being “just kind!” This is a genius piece. And isn’t it weird when that happens and you don’t even know or realize it! That’s art! 🙂 Haha – I feel a little role reversal here for a change Laura Loo Artistoo! I do know how days go but the truth is that you are bold and I am not. And boldness is a good thing! I think everything to death, including this painting lol! Too many conflicting thoughts and (in my head) conflicting businesses right now. Could art and accounting be any more different? Sorry, thinking out loud. I need to clear my mind. Thanks for your feedback, much appreciated! sooooo completely different that I cannot even imagine being inside your head! 🙂 LOL! My mind is not mathematical at all – hence making it much less of a conflict for me! 🙂 Just rock in sista! I don’t know how to tell you not to overthink. Just cherish this special day of beautiful art you shared knowing it rocked the house!!! Good morning, your experimentation led you to a beautiful place. I agree with Debi, frame it! I heartily agree with everyone else. Definitely a masterpiece of the sea! Omg Carol. You too?! I don’t know what to say. I should hush. Thank you! I agree too. I can see the water motion and the waves are cresting, just ready to crash down. Thanks so much for your kind visit and feedback, Beth; much appreciated! I don’t know what else to say, as I am very much blown away by the feedback on this painting. Kind of you to stop by and I’m really glad you see the wave, as toward the end, I was seeing that too! I love the beach and have always wanted to paint beach/water scenes, and found that very difficult to do in watercolor, which was the medium I started with last year. I like how you say “Declared what it wanted to be” and are going with the acrylic flow. I am cracking open my acrylics today! You GO, C! I am glad you’re not glowing with compliments! Thank you.
? Not glowing with compliments? Mmmm. Let me see – there is something I missed saying and that is how I love the white effect in the bottom quadrant … those waves crashing are very effective. Compliments glowing! I sometimes feel that the positive feedback is hard to believe when I see a painting I only posted because I said I’d post one every day this month. The positive feedback has been totally stunning today! And you didn’t come in talking about how I should frame it! And I was grateful for that. Ok, that sounds weird but constructive criticism is more helpful than glowing praise. I guess if I loved the painting then the praise is easier to hear than when I posted something just to post it. I’m probably not making sense. I’m going to go work out and clear my head! Thanks for your feedback and I’m glad you’re gonna drag out your acrylics! I “think” I get what you mean. The praise from others is always wonderful – I find it is most helpful when you feel it is whatever it is – so I am praising first how you let it be. I find that a most powerful artistic mode of moving and being with one’s process. : ) Critical acclaim is aways wonderful too! Yes you’re right. It’s all helpful. Ok what I really mean is that I appreciate good, constructive criticism of a piece a lot. Because I have so much to learn. The praise is wonderful and sometimes I bounce off the walls because the comments make me feel wonderful! So I’m not saying I don’t appreciate praise. I soak it up like a sponge! But I think constructive comments are probably more useful, for me, at this stage of the game. And I still dislike this painting as a standalone painting, as anything but possibly something to build on. So the compliments right now are hard to believe. I like that wave too so I’m with you on that one! And I really like that I’m seeing dolphins now, because of Cathe’s comment and others, that I didn’t paint! But provably that stainless steel color brought them forward. So I’m very happy about that. Anyway, thx for your feedback. I DO appreciate it all. I am trying to go with my process but I’m easily swayed by the crowd and now thinking of leaving this alone. Maybe after working out and clearing my head, I’ll feel differently. Oh, yes – with acrylics you can add to and create more with this – on top of this. Even put a beach ball on the wave! It’s a work in progress. It’s a mind trip, but I think the pattern stuff you do can also be! Thanks, I’m glad you understand and thanks in advance for the mention! I do hope I inspire you to try abstract work. I find that it is a tremendous way to release emotion. I think I’d do a few and see, thanks Laura! I like the idea of releasing emotion with abstract ~ expression. It helped me soooo much when Penny was sick. And even things that aren’t big like that…..I tend to stuff emotions which can lead to anxiety, and the painting – really almost any painting or even drawing can help me release that. I just think abstracts are a direct line to the emotions. At least, for me. Sometimes putting a painting away for a while….a few days, a week, perhaps even a month and then bring it out to look at it. I have done that. Sometimes my analytical mind gets in the way and no matter what you do, it gets “stuck” with this idea that something is wrong with it. Putting it away might get you to see it with fresh eyes. Ultimately you need to like it, live with it. Also try using a hand held mirror turn around and view it as though you are trying to look at your hair but you are looking at your painting. For me this has been a wonderful tool in tricking the eye. Often a “problem” will pop up and you’ll see it. Anyway, I think perhaps you are looking at the mechanics of your painting. I get more of a sense of freedom and emotion….if I were to start picking it apart with my left brain, I would say the white could use a bit of softening….etc. But I feel that sometimes you need to view a painting and appreciate a painting based upon how it makes you feel or react. If you look at some paintings that are quite impressionistic by let’s Van Gogh, we all can say….my goodness that roof looks a bit off kilter! Get what I am saying? Anyway, my two cents worth! you bet! my May Challenge partner! I almost gave up last night! And then I told myself that you and Debi were all in this with me together and I couldn’t let a painting I didn’t like stop me! Woot! Also, appreciating a painting because of how it makes you feel. I think that is really key. And the left brain will never understand that, try as it may! Thank you! I can usually shut it up when I DO the art, but if it doesn’t go well or I let myself think too much as I go …..that becomes a big pit that I fall into, the pit of thinking! Oh it’s endless and it never gets me anywhere. It’s like sitting in a rocking chair all day – you move constantly but get absolutely nowhere! I can only echo everyone else, Laura – a very pleasing snapshot of the ocean, which is going very well with the warm weather today. If only the seas around here were so enticing! Oh it’s lovely! I love the colors. Although I think I will always like your color choices. 🙂 I see the sea and a beautiful wave. Thanks, Deborah! I started to see the sea in this too and I did choose the colors to get me into a beachy place (since I was pretty frustrated and needed art therapy at the time)! 🙂 beachy thoughts are good thearpy when one can’t be there. Jill, you’re the sweetest friend ever. ((((((Jill))))))) Thank you; you’re very kind! I am glad you see joy in the painting. And if you do, then maybe that is the reason for the positive response? I definitely go for beachy scenes and colors when I want to “chill” and that’s where I was last night, trying to get a painting ready to post. I still love your background on your wine and flowers painting so much! And I agree that it gave you great depth for your finished piece, which is gorgeous! It’s that kind of depth that I feel that all of my work lacks, and has always lacked. And that’s what I’m trying to accomplish. But when I started adding white, I did start to see waves. 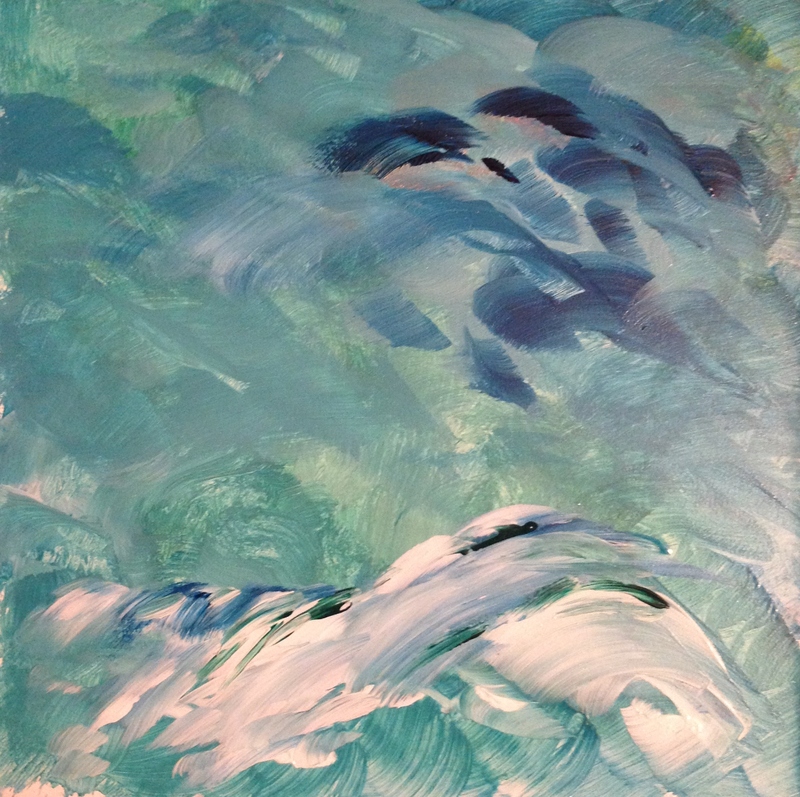 Maybe a suggestion of a wave and the dolphins you and others are seeing is enough with an abstract piece? Nothing more needed? But in sections here and there I am still seeing the white original surface, and that is bugging me. Would be fine if it were a background. Do you see this as a finished piece? Thanks so much for your feedback, Jill! Thanks, Jill, I’ll do it. Thanks a lot for your wisdom. I agree about the ugly stage! Maybe I’ll start posting stages…..like today, I wasted too much time online so I’ll probably just do a layer, maybe a background. I really have no clue where anything is going. This is almost like the abstracts I was doing last summer in my journal when Penny was sick. I just see where 2 or 3 colors will take me. I’m out of words. Thank you, Charlie. If it’s any consolation Laura, I rinsed of claybord this afternoon several times! (time to put that away I think, I’m beginning to hate it!). I love your resulting painting – and also your attitude as you didn’t get into a rut about it and give up. And look where it led you – serene, calm, soothing tones. Lovely. Thanks, Vicki, I really appreciate your feedback! Yes, I can totally see where someone could learn to hate these surfaces. They are a double-edged sword, no doubt. Does the claybord rinse completely? This gessobord doesn’t. It always leaves little bits here and there. Not such an issue in acrylic but I am wanting to try some of the aquabord I purchased too. Very curious to see a watercolor painting surface that apparently can be rinsed, dried and ready to start brand new! Apparently you can sand back the claybord or use wire wool! I imagine the gesso doesn’t go quite that far, though you could always gesso it again. Yes, I’m interested to see your aquabord explorations too! I’ve only tried to claybord. I’m not inclined to use the gessobord as I like cutting up my own surfaces for oils and acrylic, mostly because it’s cheaper and also I like to paint square in particular sizes! Vicki, do you use Masonite? I would love to save money too, any suggestions would be great! Do you create an archival surface in the process? I thought about using Masonite and maybe some type of sealer? What do you think about that? I’d love to custom cut my own pieces. Love this idea! We don’t have masonite in the UK – I just had to google what it is! I buy either sheets of MDF or thick plywood and get my handy hubs to cut them for me. He just uses a saw, no fancy machine. And then it depends – I’ll either use store bought gesso and do two coats of that, or sometimes, if I can be bothered, I’ll use a mix of acrylic primer (from a hardware store) and polyfilla powder – this makes a lovely surface for oil paints. And I like a textured surface – so I like visible brushmarks and also I often do the second coat of gesso using a palette knife to create interesting texture. In fact, I’m doing that right now in the garden! (and typing this in between coats!). There is something earthy about prepping your own surfaces….you feel invested and involved right from the start! Thanks so much, Stephen. It is really just a couple of colors of acrylic paint scumbled on a white gessoed surface with a bit of white added here and there. I really only intended this as a background until the white was added and the wave started to take shape. Really appreciate your feedback. PS Yes, Debi is a big abstract painter and I think her take on abstracts is much more helpful than mine can be! I don’t “love” a lot of the things I do and sometimes post. We’re our own biggest critics! When I saw this Laura–I thought immediately of water. I love the color and the movement-very nice! Thank you! I’m coming to appreciate this painting more after all the great feedback. Thanks for your time and for looking. A question you must I to ask yourself, when is a painting complete? Then walk away from your piece for a couple of days. Wise words, thank you once again Connie! I like that title for the painting too. Thanks for your visit. Please use that title. Wonderful work you’re doing. Wow, what a kind thing to say. You made my morning! Thank you. Thanks, Denis! I’m glad you’re seeing the water. I was imagining a beach scene as the colors started to come together. Adding white really made the difference for me. I appreciate your thoughts! I can see it, the sand bar is almost going under with the tide, the shallows, deeper water , its all there. I spend a lot of time roaming around our cliffs looking down on the bay. Oh, Denis! I love it! What beautiful images you’re now evoking for me as well! Thank you! Lush, I missed this post for some reason, I have not tried claybord, but I so need to, lovely colours with so much movement and yet tranquil and relaxing. Thanks, Rebecca! I don’t know how different claybord might be from gessobord – which is what my last four paintings have been on. I think Vicki uses claybord. I’d like to try that one also. They also make one for wc called aquabord. I have some small pieces of that I plan to try this month too. Glad you liked this! I was really surprised by the reactions to it. Do you see anything there or is it just the feeling it gives that you like? Oh that’s interesting I thought it was the same thing…I need to try all three of these things then, lol….I see water swirling gently in a jacuzzi ….but mainly it’s a feeling I go for, and not what it is, I like in art where each viewer could see something different, that’s why when we paint we often feel let down by ourselves, we know what we intended, if it does not go to plan we feel cheated of that gratifying feeling. But the viewer sees it for just what it is, and what they want it to be, and so can love something we don’t initially like…..six months later, we forget what our intentions were, and can fall in love with a painting we had hated, or could not bond with. I love that. Wow, you say that so well. So true!!! I love this. I should print it out and tape it to my wall. Thank you! Oh yes, I think we all should, I have to remind myself constantly, and it does help. Wow, Laura, you knocked this one out of the park with all the comments! I definitely see the dolphins with the ocean waves and a storm brewing above. Beautiful! Thanks! I was so glad to see the dolphins once Cathe pointed them out! So glad you like it, Donna!